Loft conversion is the most popular choice for people trying to create an extra living space in the UK. Lofts are traditionally considered damp areas that house old furniture and Christmas decorations among other items. However, a loft can give you the extra space you need without extensions that consume part of your garden. Before laying out a simple step by step procedure to follow when converting your loft, note that it’s a difficult undertaking that require extensive experience, and “I can do it myself” attitude. If you are ready to convert your loft, then there are certain things you’ll need to consider before you commence work. Building blueprint that indicates the strength of the floor and fire escapes. Most loft conversions don’t require a planning permit. You are required to obtain permission if your loft design will alter your roof space. Nevertheless, you cannot leave matters to chance; hence, check with your local council or planning officer to know whether you require a planning permit. More about planning permission and considerations will be discussed as you read the guide. Some lofts can’t be converted. Before you plan for the conversion, conduct a brief survey to establish whether your loft is suitable. The things you should look for include roof structure, height, space, chimney or services, and felt. Roof structure: Do you have a traditional cut rafter roof, or a purlin roof, or a trussed roof? Height: Does your loft have enough height? The minimum height you’ll need for a traditional roof is 2.2 to 2.4 meters. The minimum height for modern trussed roof is 2.4 to 2.6 meters. Space: Is the loft space enough to be converted into a usable roof. Services or Chimneys: You should make sure no services or chimney run through the loft space and no movement is needed. Felt: Is your roof weather proof or has a felt under the tiles. If your roof is not fitted with a felt, you will see the backside of the roof tiles. Roofs with felts have black bituminous paper placed under the tiles and battens. If your loft meets all the specifications stated above, the next step is to find out the type of loft conversion you could have. Three factors determine the type of loft conversion you could have. These factors include your roof type, the intended use of the loft, and your budget. Based on the aforementioned factors, you have three types of loft conversion to consider. They include internal loft conversions, dormer loft conversions, and conversions that need the removal and restructuring of the roof. Internal loft conversions are the most budget friendly and require minimum expert intervention. Nevertheless, dormer loft conversions are the most preferred in the UK because of the extra space they provide and the ease of building them. Loft conversions that require full removal and restructuring are likely to cater to all your needs, but they are the most expensive and require expert builders. Roof lights: These are the cheapest loft conversion because they are built by simply converting the existing loft space. These types of loft conversion require very few changes to the roof space. The alteration made while constructing roof lights include cutting out windows on the existing roof slope, insulating the loft, and strengthening the floor. Apart from the overhead windows, all the main changes such as strengthening the floor, adding a staircase and insulating the loft are done internally. This means that you don’t need planning permission when converting your loft into a roof light. These types of conversions require the addition of dormer windows to increase the space in the roof to accommodate a standing grown-up. Dormer loft conversations are usually added at the back, but you need to obtain a planning permit. Dormers can also be added to the front or sides of your house. After a dormer loft conversion, the additional space created is large enough to be used as an additional bedroom, home office or study room among others. If you opt for a dormer loft conversion, there are five types of conversions you can choose from. They include single dormer, full width dormer, side dormer, L-shaped dormer, and Hip-to-Gable dormer. Single Dormer: These types of dormers are preferred in areas with strict conservation rules. Two single dormers can be used to add symmetry to your property and increase space. Full Width Dormer: This type of conversion results in extra space and a unique type of loft space. Side Dormers: Side dormers are suitable in increasing the head height for property with hipped roofs. L-shaped Dormer: This type of conversion works on specific properties, for example, Victorian properties with an extension to the rear. Hip-to-Gable: Building this type of conversion involves replacing one or a couple of hips with a gable wall. The roof is then extended to cover the gables creating an extra space, which is enough to accommodate a standing grown-up. Mansard conversions: These types of conversions are done on one or both slopes of the roofs whereby both slopes are replaced with new structures with very steep slopes, almost as upright as the walls. The steep slopes are covered with an almost flat roof. This type of conversion is suitable for houses with roofs that leave a little space in the loft. You need a planning permission to have a mansard conversion. Prefabricated loft: This type of conversion works well when the vertical space inside a roof is limited. Fabricated loft conversion enables the replacement of the existing roof structure with a larger one. Most roofs are built with internal support structures located in the loft. All the roof support in the loft has to be removed and replaced with new ones that don’t occupy the space available in the loft. 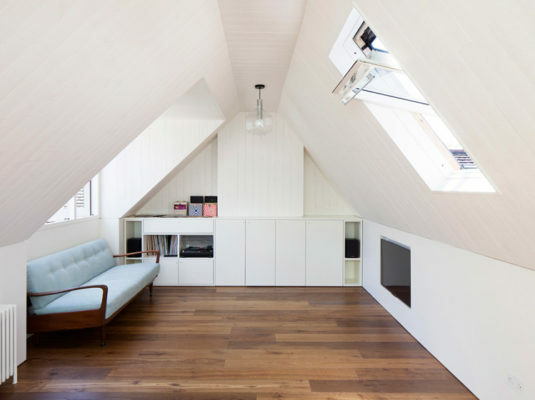 We have discussed the different types of loft conversion you could opt for. However, the one thing all of them have in common is that the ceiling can’t act as a floor. Turning the ceiling into a floor requires additional support. This’s achieved by fitting new support alongside the old roof support structure. The support is slightly raised to avoid contact with the ceiling plasterboard. In most cases, the support is raised 200mm or 225 mm above the existing ceiling joints forming floor structure. Depending on the width of the new support, it will either rest directly on existing wall plates, or on newly installed beams. In smaller loft conversions, the floor support also supports the sloping rafter. This is attained by building a small timber stud wall 1 meter to 1.5 meter high between the floor support and the sloping rafters. After building the support structure, it’s now safe to remove the internal struts and braces. Designing stairs for a loft conversion project is one of the challenging parts because the space for the staircase is limited. Having narrow, winding stairs is the most common staircase design, but this may be impractical because it’s difficult to move furniture into a loft with a narrow staircase. Moreover, building custom staircases costs approximately ten times the cost of a normal staircase. You should keep the preceding factors in mind when planning the staircase design for your loft conversion project. If you need advanced staircase design, it’s prudent to have the staircase design approved by the Building Control officer before proceeding. Your loft staircase design should lead to an external door or hall. If you opt for an open-plan staircase design where the staircases are located in a room, you will have to change the plan by installing a new partition wall or alternative escape routes. When fitting windows for your loft conversion project, you don’t have to make significant structural alterations to accommodate skylight windows and roof-light if it’s your first time handling a loft conversion project. In most cases, windows are fitted on either side of the roof-flight. One of the most preferred alternatives is dormer windows, which are also independent structures because they have walls, a roof and the windows. Dormer windows are fitted at the back of the house in many cases, and this means that most dormer windows don’t require a planning permission to build. However, if dormer windows are located in the front of the house, planning permission is required, and this is the reasons most people opt for roof-light or skylight windows. Fitting dormer windows may be necessary if you want to increase the headroom in the loft and avail a usable space. When constructing a dormer window, your loft will be exposed to the elements of weather, and it’s a good to have temporary sheeting for protection. If you live in a bungalow, then a loft conversion project is less likely to block your fire escape. Nevertheless, you should make sure that the windows are spacious enough to be used as an emergency exit. If your loft conversion will create an extra storey, then there are issues you will need to handle. The additional floor will require at least 30 minutes of fire protection, and this could mean having an additional layer of plaster below the ceilings, and the loft room will also have to be separated by a fire door, at the top or bottom stairs. Moreover, you’ll also have to install one large escape window in every room. Some types of skylight windows are designed with an escape plan in mind. Automatic door-closing devices are no longer used in homes because they put children at risk; they can trap children’s fingers. The best solution is replacing the existing doors on the stairway i.e. the doors on the ground and first floor should be replaced with fire-resistant doors. You should indicate this on your loft conversion design for Building Control. It’s a good idea to have mains-powered smoke alarms installed on every floor of your house and interlinked so that all alarms go off when one is activated. The authorities have increased energy efficiency standards over the years, and this means it’s now difficult to insulate your loft than before. If your conversion includes replacing the roof tiles, you can place insulation between the rafter and the covering. This gives you a good airtight insulation. If you choose to replace the roof, the sloping ceiling will require insulation fitted between the rafters, and on the underside of the rafters. The insulation should be as thin as possible because the plasterboard will have to be fitted to the rafter through the insulation on the underside. When choosing insulation, go for high performance insulation, for instance, a form or board should be used to cover all the areas that need insulation. The partitioning walls and dormers also need to be insulated using similar materials. The newly constructed floor in your loft will need soundproofing, and this can be achieved easily by placing a mineral fibre between the supports. You should use heavier, denser materials for sound insulation and not the lighter material used for thermal insulation. The internal stud partition between bathrooms and bedrooms should also be insulated using heavy sound proof material. Lighting a converted loft require the inclusion of different light sources just like the other rooms in the house. Some of the light sources that you need to include ambient lights that can be used during the day, task lights used for things like reading and working, and accent lights, which improve the atmosphere of the lighting. Track light and down-lights are suitable for sloping ceilings. Maximising energy efficiency requires making the roof space as tight as possible. However, balancing between energy efficiency and ventilation requires controlled ventilation to prevent water vapour from condensing. Having an extension will definitely increase the heating requirements for your house. A quick solution is to upgrade your boiler. Other alternatives include installing heat radiators, under floor heating, or a combination of these methods. However, if your loft conversion added an extra bathroom, you will definitely need a boiler upgrade. Plumbing is crucial in conversions that add an extra bathroom. The location of existing plumbing services, should be taken into consideration before building commences. A quick solution is to supply your newly converted loft with plumbing services by branching off from the existing plumbing system. This can be done using flexible plastic piping. Electrical alteration may be required during a loft conversion. You can extend the existing circuit depending on the condition and age of your current system. In some cases, you may require new circuits and distribution board. You should get sound advice from a certified source. When you turn your loft into a bedroom, bathroom, bar, office or put it under any other use, you lose some storage space. You can create storage spaces behind the partitions. If you decide to turn your loft into a bedroom, you can install built in wardrobes for extra storage. Now that you know the types of loft you could opt for and the procedure for converting lofts. Let’s look at some of the frequently asked questions to help clarify some pertinent issues. Should I Obtain A Planning Permission Before Converting My Loft? As noted earlier, most loft conversions are considered permitted development because you are not changing the existing blueprint. Nevertheless, your loft conversion design will have to adhere to a number of regulations. Check with your local planning officer to know the rules before you start working. Do I Need To Get An Approval From The Building Regulations? Of course, you need the approval of the Building Regulations because a control survey officer will have to inspect your construction at different stages, and gives you a certificate upon completion and final inspection. People living in terraced or semi-detached homes will have to notify their neighbours about the construction plans if the requirements fall under the Party Wall Act. How Do I Design My Loft Conversion? You are presented with two options when shopping for a designer for your loft conversion project. For people interested in converting their loft by themselves, working with an architect or designer is the best option. This option gives you the autonomy to tailor the design to your exact preferences. Moreover, working with an architect or designer is suitable for people working on a small loft conversion project. The designer or architect you are working with will create drawings. You can put the designs to tender, especially if you need to hire a structural engineer. The second option is hiring a design and building company. This option is prudent for people looking for an all-inclusive service and is not interested in “Do It Yourself” type of conversion. Several factors determine the amount you are likely to spend when converting your loft. These factors include the structure of your roof, the available space, and whether major alterations are needed to complete the project. The prices discussed below are estimates of the cost you are likely to incur depending on the type of conversion you opt for. Building a dormer loft extension is similar to converting your loft into a room, but with the exception of dormer windows. The windows increase the floor space and gives extra height. This gives more option when you are constructing stairs. Constructing a dormer loft extension can cost you approximately £20,000. If you opt for a double bedroom conversion, then you may have to spend from £35,000 to £45,000. Conversions that require the alteration of the roof structure are the most expensive. This type of conversion requires professional builders and the approval of planning permission. You are likely to spend £40, 0000. Do I Need To Buy Insurance For Self-Loft Conversions? You need to arrange for insurance if you are going to do the loft conversion by yourself. The insurance will cover the new works and the existing structure. Most home insurers never cover the loss or damage to property when it’s altered. If you have successfully converted your loft into an attractive living space, it will add value to your home. Extended lofts not only increase the price of your home, but also create the much needed extra space. For instance, a survey done by the Nationwide Building Society found that loft conversion increases the value of your house by 22%. This is a significant increase given the fact that you don’t have to lose part of your garden during the extension. From the above discussion, you have seen that converting a loft into a more useful space requires careful planning, budgeting and execution. You can use this guide for your loft conversion project. Just make sure you follow the guide carefully, and make all the preparation before starting work. Failure to do so may make you incur unnecessary losses. Moreover, it’s prudent to have an insurance cover to protect you against any accidental losses during the construction. However, if you are not confident in your skills, you should hire a professional architect to make sure that you get a quality loft conversion that adds value to your property and stands the test of time.